It’s New Year’s Eve – in case you hadn’t noticed – and as the midnight chimes of Big Ben fast approach and I wave goodbye to both sobriety and 2010, here are ten serious and not-so-serious predictions for some of the major news and entertainment stories I expect the next twelve months to bring us. 1. 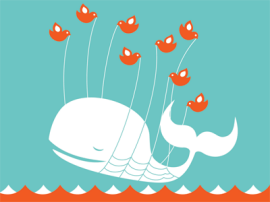 Twitter users will be familiar with the ‘fail whale’, which appears whenever the service is overloaded or suffers some other serious problem. Its first appearance in 2011 will occur on the stroke of midnight tonight Pacific Standard Time (0800 GMT), as the whole of the West Coast attempts to post “Happy New Year” updates at exactly the same time. 2. Apple will launch the iPad 2 and the iPhone 5 amid a fanfare of publicity, which will be followed by a hail of criticism over the products’ perceived or actual shortcomings. It will make absolutely no difference, as consumers snap them up in their millions. 3. 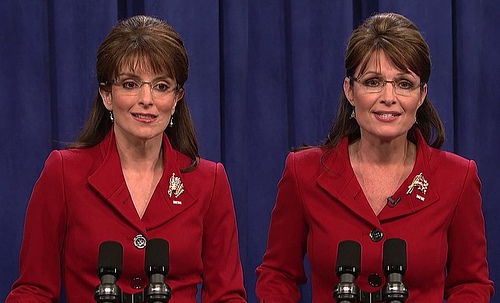 Every idiotic untruth – and their number will be legion – uttered by the moose-hunting Republican Party politician Sarah Palin will only endear her further to the very large minority of people who believe it is a good idea for someone as ignorant as they are to be a credible contender for the highest political office in the most powerful nation on the planet in the 2012 presidential election. 4. January will see record labels rushing to promote their new acts as the ‘next big thing’. By December (if not earlier) we will have forgotten who 90% of them are. 5. Wealthy Tory MPs and peers will remind us of the need to make sacrifices as a nation in difficult economic times, while finding new and imaginative ways to claim expenses. 6. Katie Price will divorce Alex Reid, get back together again, possibly re-marry, and then split up again. And all the mundane details will be brought to us via yet another reality show on ITV2. 8. After a lucrative, record-breaking tour, Take That will split up again. The Samaritans will receive a record number of calls from distraught women and girls. Two weeks later, Boyzone will announce they are reforming. So that’s alright, then. 9. 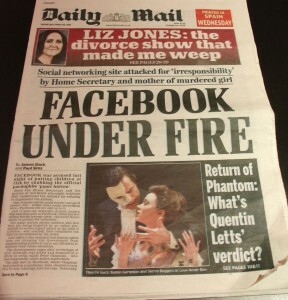 The Daily Mail will run a series of ‘in-depth’ features proclaiming why Facebook is the greatest evil mankind has ever faced, and how it is solely responsible for paedophilia, bullying, anti-social behaviour and the fragmentation of the nuclear family, as if these had never existed prior to social networking. And finally, a Happy New Year to everyone! Posted in Journal and tagged 2011, Apple, Big Brother, Boyzone, Daily Mail, Facebook, Katie Price, predictions, Sarah Palin, Take That, Twitter. Bookmark the permalink. And a Happy New Year to you, James. Tim, these seem very prescient…..I wouldn’t bet against any of them! A good Dublin band worth following is The Script. My ex (still a good friend, by the way) is a huge fan of theirs and I like them even though their songs are about relationship break-ups. Damn, I need to see my therapist again. iPad 2 is a definite. I reckon it’ll be widescreen, have the ability to make voice/video calls and be thinner and lighter. Possibly with 3D capabilities, but that’s an outside bet IMO, but maybe with mulitouch. The iPhone is gonna hang on for another year, I reckon, but the software will be updated midterm; with what, I cannot guess. iPad 2 should be with us within a few months if the rumour mill is accurate, which it often is. Front & back cameras to allow FaceTime video calling looks extremely likely. I’m expecting an iPhone upgrade of some sort in the summer, but not necessarily a big step – probably something akin to the 3GS launch with, as you say, an iOS upgrade to go with it.